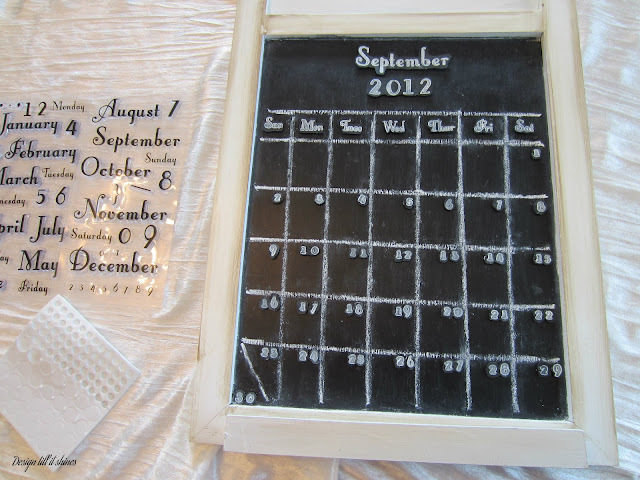 I have been wanting to make a chalkboard calendar for quite some time. 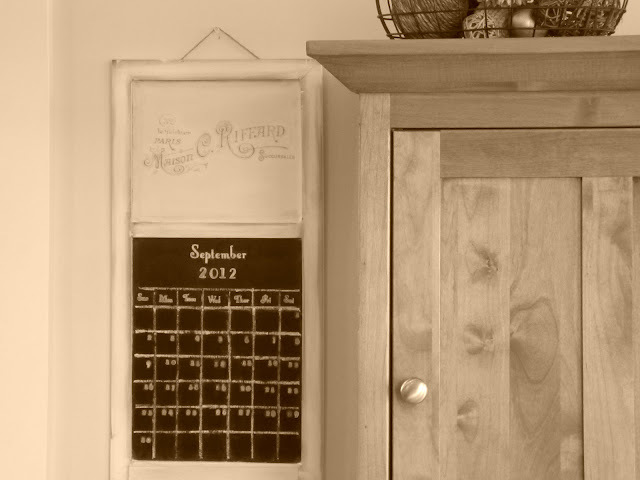 I consider calendars to be a decorative item as well as functional. 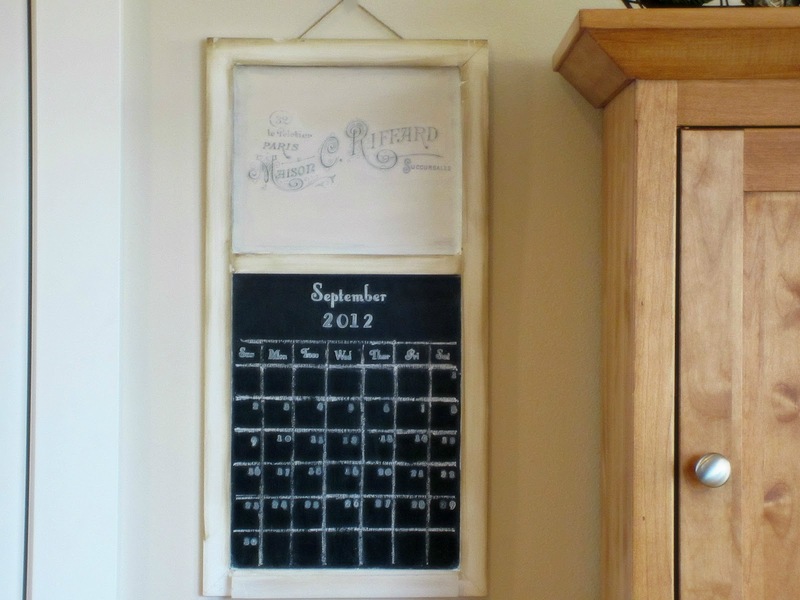 I have seen quite a few chalkboard calendars online, but many of them used a calendar decal or vinyl mat for the calendar part. I decided to create one with some of my stamps. I then added a Graphics Fairy french style transfer to the top of the chalkboard. I found this chalkboard on clearance at Joanns. It's not hard to figure out why it was priced so low. It was really gaudy with the rooster and the bright patterns. I knew I could do something with it because it was the exact size I needed for a space on my kitchen wall. I should have bought another one but at the time I couldn't see past the crazy design. I mean I like roosters but not like this! I had to use two coats of gray craft paint just to cover up the design. I then added some oyster white because it went well with the frame. 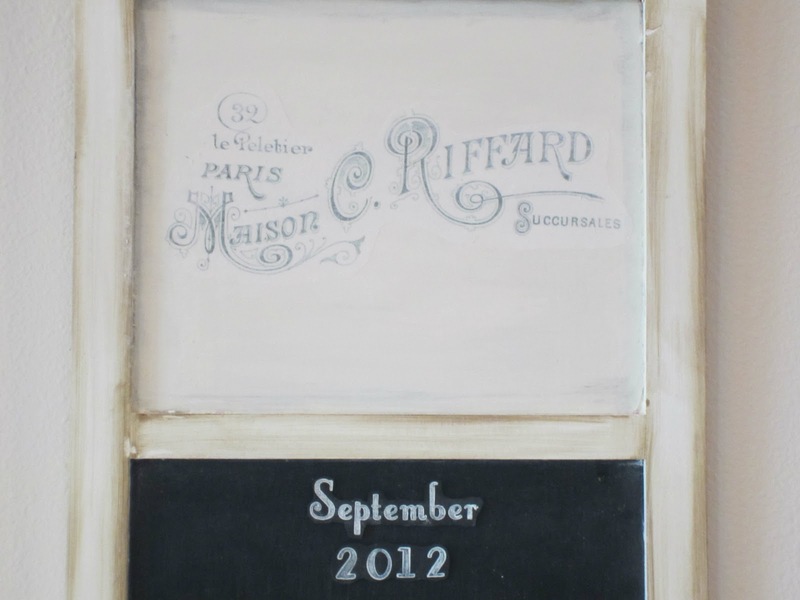 I had a set of calendar stamps with months and days so I decided to use those to decorate the chalkboard. I really like this set, but the smaller numbers were rather tiny. 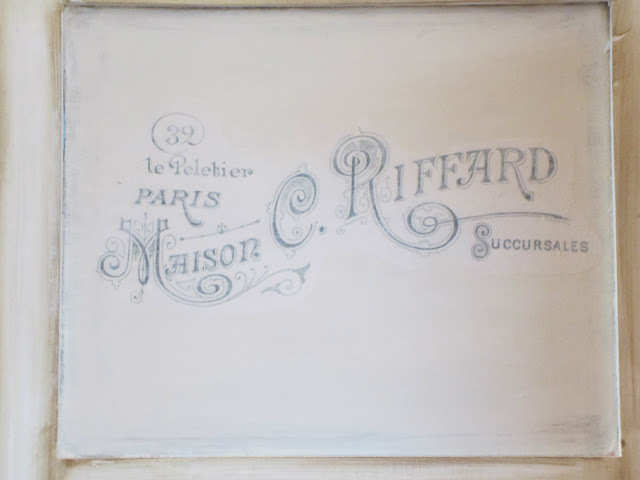 I discovered it can be a bit messy trying to draw grid lines and adding small pieces to a chalkboard of this size. Everything did not go according to plan, but I completed it which was my main goal. I thought it might be a cute idea to have a calendar that you could change by moving the months and days around without drawing and erasing. 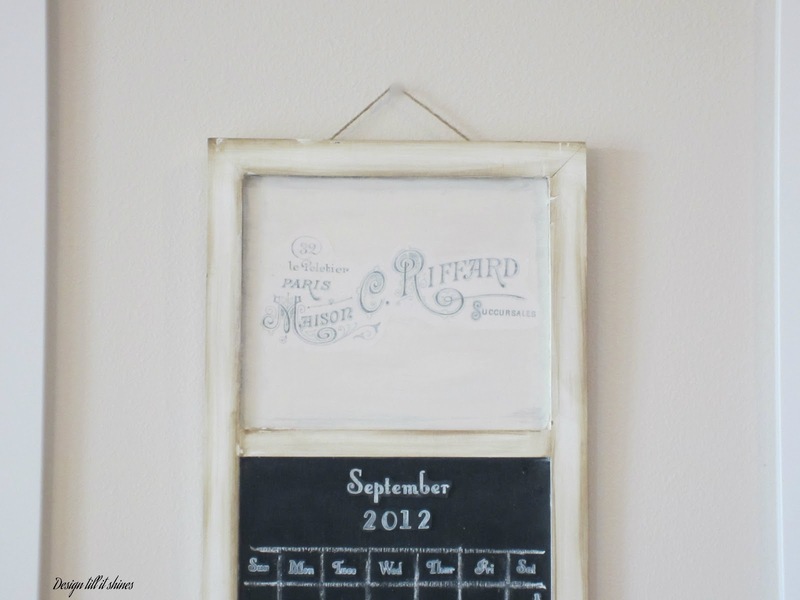 Since August is almost over I decided to do September and I stamped out the month, days and numbers. I then attached the little pop dots to the back of each piece and assembled it. I have to say I do not recommend doing it this way because it takes too long to assemble everything. 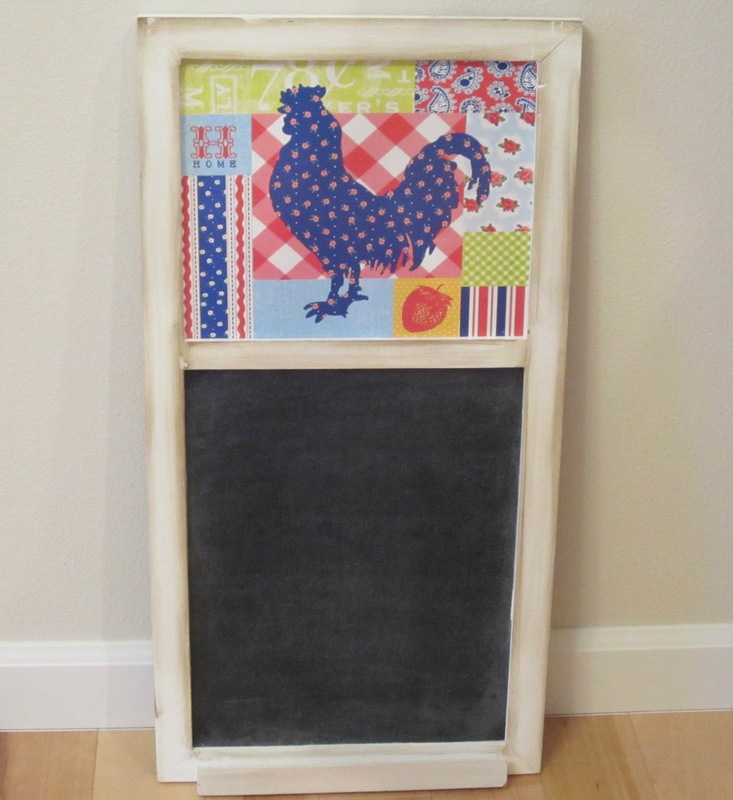 I like quick projects but I always seem to want to try something that is time consuming! 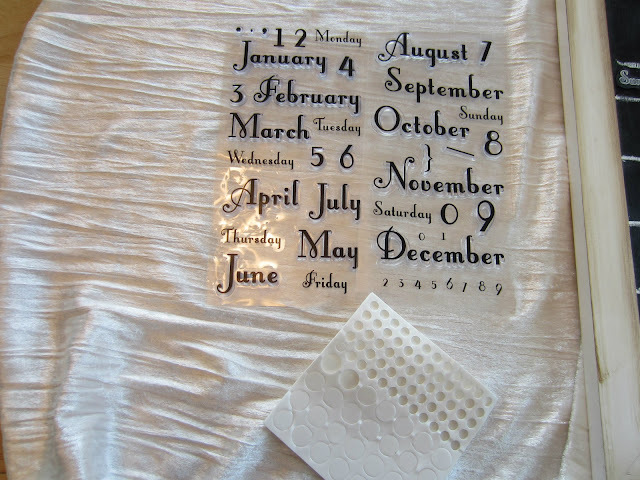 It's hard to tell in this picture but by using the pop dots it gives a dimensional look to the calendar. I softened this image a bit to give it more of a vintage feel. 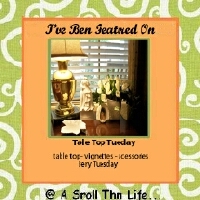 I found a transfer I liked from the Graphics Fairy and added it using the mod podge transfer method. I added a soft glaze to it after I finished so it would blend in with the paint. Since it's almost fall I plan on changing this calendar soon to match the seasons. I'm happy with it overall, but I like the graphic part of the calendar the best. And that was the easy part. Isn't that just the way it goes. Thanks for stopping by. I hope you'll take time to leave a comment! How cute Diane. I really liked the rooster, but of course he was a bit outdated. This redo is fabulous. Thanks for sharing with the newbie party. That is a vast improvement, I like roosters but that rooster was a bit much lol. You did a great job. Very pretty transformation! 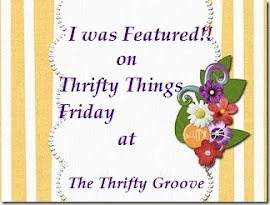 Thank you for sharing your project at Potpourri Friday! I am happily following you! Be sure to leave a comment on what is on you Home Depot list for a second entry! Great transformation...Thank you for sharing it at Share it One More Time. Although it was a hassle to do, I love the way it turned out! You did a wonderful redo on this piece! 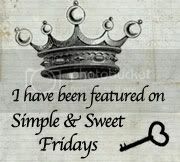 Thank you for joining TTF and have a great day! Wow ... I love this idea and it turned out really nice. 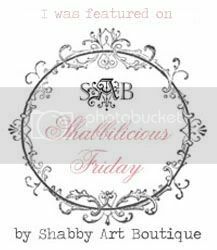 Love the Graphic... need to copy that but do not think i have the patience to do a calendar. 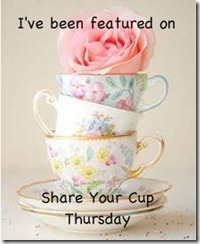 Just stopping by to thank you for linking up to Share it One More Time....and to let you know you have been featured. Congratulations and please grab you featured button it is located on my side bar. Hope you come by and link up again.